On May 6, Hunter Dozier was looking forward to playing left field for the 11th time this season, a move the Royals put in place to increase his defensive versatility. A shortstop in college who had his primary position moved to third as a pro, Dozier instead was told by Double-A Northwest Arkansas manager Vance Wilson that he was starting as designated hitter, where his legs would be saved for another new experience entirely. "He said, 'Don't ask any questions, but it's a good thing,'" said Dozier. "I kinda got the idea." A month into his third season at Double-A, the Royals' No. 15 prospect was moving on to Triple-A Omaha while rebuilding his stock as a potential contributing member of the defending World Series champs. Kansas City made Dozier the eighth overall pick back in 2013 -- one year before the big club reached its first postseason since 1985 -- after he hit .396 with 17 homers as a junior at SFA, making him the highest drafted player in school history. He didn't skip a beat upon becoming a pro as he hit .308/.397/.495 in 69 games at Rookie-level Idaho Falls and Class A Lexington that summer. In 2014, he got off to a good start with a .295/.397/.429 line in 66 games at Class A Advanced Wilmington but saw those numbers drop to .209/.303/.312 in a 64-game stint in the Texas League to finish the season. What's more, his strikeout rate jumped from 21 percent in Class A Advanced to 26.2 percent. Those numbers aren't ideal in any case but can at least be explained by the fact that development isn't always linear and the jump from Class A Advanced to Double-A may be the most difficult in the Minors. But 2015 -- Dozier's age-23 season -- wasn't any better. He hit .213/.281/.349 in 128 games for the Naturals as his average never climbed above .245 in any given month. His 151 strikeouts were second-most among all Double-A hitters, and his 28.9 percent strikeout rate was third-worst in the Texas League. With 12 homers, he couldn't claim significant power as a saving grace either. To no one's surprise, his stock slipped. Ranked as Kansas City's No. 4 prospect at the end of 2014, Dozier fell to No. 12 at the end of 2015 and was placed at No. 15 before this season began. So the right-handed slugger went to work, venturing to Arizona this past offseason to work with Royals hitting coaches and coordinators on fixing what they could and salvaging Dozier's previous hitting prowess before he became a career Double-A hitter. They found some answers. "Mechanically, I've tried to be a guy my whole life who gets his front foot down really early so I can see the pitch," he said. "I thought if I could see the pitch early, then I'm better off. So I was playing around last year, trying to add more rhythm and trying to be more relaxed. The higher you move up, the harder the pitchers, and there's more breaking stuff, so I really felt I needed more rhythm in my swing. But when it wasn't working, I tried to fix it during the season, and mentally, that got me screwed up. That's why I worked on stuff this offseason -- getting to an approach and sticking to it, so I didn't have to go through that again." All the previous tinkering had come from Dozier striving to live up to an ideal, but it wasn't an external pressure to perform like a first-round talent that had hurt his approach. Rather, that came from within. "There's always a little extra pressure as a first-rounder, but once you're drafted and in the game, it doesn't really matter where you were picked," he said. "Personally, I think the pressure comes from what I put on myself. I try to be perfect in everything, and sometimes like last year, that means I'm trying to do way too much. I wanted to get out of Double-A and to Triple-A and make a push toward the big leagues like everyone else, and I got caught up too much in that." One of the first changes was to stop messing with his batting stance. Dating back to his college days, Dozier had experimented with keeping an open or closed stance at the plate. In some videos from 2015 (such as this one), you can see his right foot starting out and then being brought into place at about the same time the pitch is being released. Compare that to the homer below in which he's much more closed and in line, and the foot acts more to establish drive than simply to set up the stance. "Right now I'm just trying to stay relaxed," he said. "See the ball out of the hand first before jumping. Not trying to get too aggressive by trying to hit the ball before I even see it out of the hand. Just staying balanced, being relaxed before I try to do anything else." The result has been a lot more hits and a lot more power. Dozier hit .305/.400/.642 with eight homers and eight doubles in his 26 games back with the Naturals, matching his home run output from all levels in 2014 in 363 fewer at-bats. He went hitless in back-to-back games only once during that stretch. Fewer zeros on the board meant fewer reasons to overreact again and go back to tinkering as he had done so often in 2015. But upon tasting the sweet air of Triple-A, the 24-year-old experienced his first struggles of 2016 by going 1-for-11 in his first three games against Iowa. Instead of overreacting, though, he trusted the groundwork he had laid in the offseason and changed nothing. 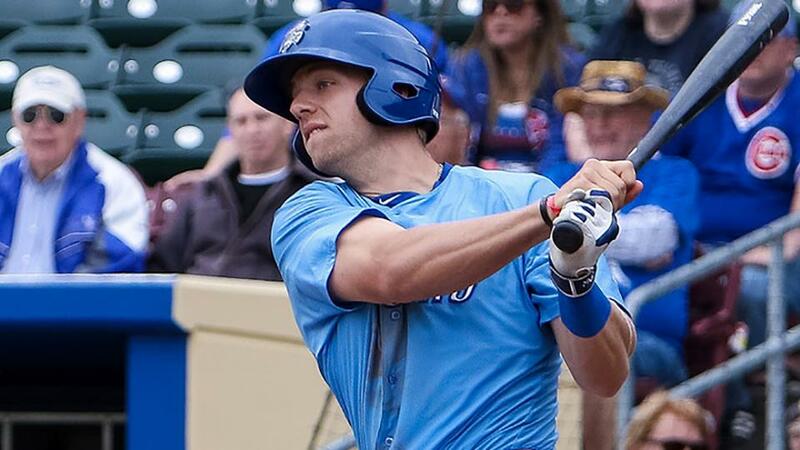 The result: Dozier is currently riding an eight-game hitting streak for the Storm Chasers during which he is 14-for-34 with four homers -- including two Thursday night -- four doubles and 10 RBIs. The confidence has remained, and so has his hitting ability. "I was going really well in Double-A, to the point where I don't think I had a time where I struggled or even had a couple games where I didn't get a hit," he said. "But honestly when I came here, those first couple games were just baseball. My timing was a little off after moving up, but I stayed patient, I thought. What I worked through this offseason helped me. When I don't feel like I'm doing it, I'm not overthinking it like before. Things will get turned around, and they have here." Now that Dozier is one step from the Majors with a rebuilt reputation, Royals fans can get back to wondering if he will be the organization's planned replacement for Mike Moustakas, who is a free agent after next season, or if he can speed up the process by adding versatility via the outfield. Meanwhile, the slugger isn't looking forward to spending as long in Triple-A as he did the level below. "It's good to finally be here," he said, "but I'm still not where I want to be yet."